Stoneplates are symbols of true knights, and red stoneplates are granted to those who valiantly face Chaos. 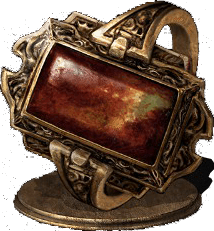 Flame Stoneplate Ring is a Ring in Dark Souls 3. Found on a corpse hanging at a tree on the edge of a cliff near the entrance of the tower with the giant in it at Undead Settlement video location (fextralife video starting at 12m). Try starting at Undead Settlement bonfire, go through first house to fire with Evangelist and worshippers, hang a right to cross the small bridge, and before going into the house along that path, break some boxes and find a path skirting the house to the right. Keep following that little "peninsula" over roofs, etc., while keeping your orientation by always finding ways to move toward the bell tower in the distance. Ring is indeed on a corpse, but it must be cut down. Because of the position of the tree, the corpse often falls down below the cliff. If that happens, there's no jumping after it. You must backtrack til you're at the regular entrance to the tower. Don't homeward bone to shorten backtrack; if area reloads, corpse will again have to be cut from the tree. It is possible to cut the corpse so it doesn't fall below the cliff, but you have to carefully edge out so when you swing your sword the corpse is knocked back on to the cliff. +1 Version (NG+): Located in the Profaned Capital. The ring is located on a ledge below where you fight the enemy that drops Logan's Scroll. Flame Stoneplate Ring Bow Method: You can obtain the ring easily without ever climbing up to the tree where it hangs: just shoot an arrow to the left side of the corpse hanging from the tree at the top of the hill from the bottom of the chasm and pick up the ring after it falls and bounces down to you. When you cut down the corpse, if it falls down the cliff just quit and reload. It loaded the corpse lying on the ground on top of the cliff for me. The stoneplate rings are nerfed way too hard for PvP. Sure trim them a bit compared to PvE, but 6% absorption for +2? At last I can breathe easy around a pyromancer chucking 1,000HP chaos bed vestiges knowing they will only do a paltry 940HP. I got the covenant, then saved and quit in the pit where you spawn. Reloaded and the ring was sitting on the rock below the tree. Why is everyone advising to do this the hard way? No need to go all the way down to get the ring: reload your game after cutting the body down and it will reappear on the cliff. I usually reload when I want to leave the Moundmaker cave after joining the covenant, so I don&apos;t need a homeward bone to get out. Since the Mound Maker guy isn&apos;t hostile until you kill the tree it seems, you can go to top of the ledge on your first run-through. Instead of shooting/slashing it down immediately and sending it down the cliff, instead walk up carefully onto the rocks its swinging above and nudge it towards solid ground before rolling or attacking to break it free. Saves one a long trip in either direction. I shot an arrow at the hanging body and it feel into the crevice. It did not respawn after that. It&apos;s not on the roof level where you fight the enemy that gives you Logan&apos;s Scroll. Go back the stairs where you see an entrance leading to a room with a hand face hippo. Face the doorway and turn 180 degrees and walk forward. Do not roll or move too fast or you will miss the tiny ledge. I think the current description on this page is quite misleading. I believe it is possible to miss the ring if you die before collecting it after it drops down. It&apos;s below the main entrance of where you enter to fight the single hand-face monster. Go up the elevator from the Road of Sacrifices bonfire and, look UP to your left from walking out of the tower. The corpse with the ring is on a tree very high above you. Again, shoot it down with your bow UP to your LEFT from facing the exit out of the tower building. It probably won&apos;t drop down to you, so you&apos;ll likely have to trek all the way around to the rooftop area where the thrall a-holes are and where the guy with the cage that takes you to the Mound-Maker covenant is. The ring should be there. on went exactly where is says in discription, and found "trash" on the body, instead of the +1 ring. Any help ? From the entrance of the tower look up to the left. There is a hanging body in the tree. Shoot it down. Should it fall on the ground uphill instead of to your feet: backtrack, until you reach the big fire with a lot of dudes praying to it and the Evangelist woman, cross the bridge, climb up the roof and jump down to the right where there&apos;s one of those guys with a cage on his back. After few resurrections ring is not there when i get there. Neither up in the hanging body. ?? ?